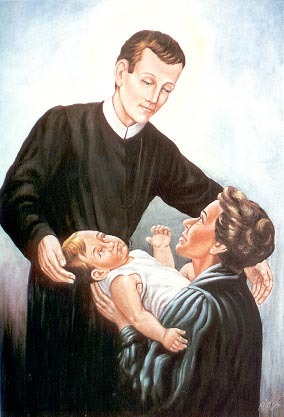 Gerard Majella (1726-1755) is known popularly today as “The Mothers’ Saint.” It may seem odd that a male religious should be the saint for mothers, mothers-to-be and those wanting to become mothers. The origin comes from an incident that happened in the last months of his short life. Once, as St. Gerard was leaving the home of his friends, the Pirofalo family, one of the daughters called after him because he had forgotten his handkerchief. In a moment of prophetic insight Gerard said: “Keep it. It will be useful to you some day.” The handkerchief was treasured as a precious souvenir of Gerard. Years later the girl to whom he had given it was in danger of death during childbirth. She remembered the words of Gerard, and called for the handkerchief. Almost immediately the danger passed and she delivered a healthy child. This wonderful story was the beginning of devotion to and belief in the miraculous powers of St. Gerard in favor of women who are soon to become mothers, who long to be mothers or who already are mothers. The Redemptorists were not the first to encourage devotion to St. Gerard. The popularity of this devotion is due, first of all, to all the Italian women and mothers who believed and promoted their confidence and trust in the intercession of St. Gerard. It was Italian mothers who spread this devotion throughout Italy and Italian immigrant women who took the devotion with them to many parts of the world. Gerard Majella was born on April 6, 1726 in Muro, Italy. He was the son of a tailor who died when Gerard was 12, leaving the family in poverty. Gerard tried to join the Capuchin order but was denied because of his ill health. He was later accepted as a Redemptorist brother serving the Redemptorist congregation as gardener, tailor, fundraiser, peacemaker and spiritual adviser. His intercession is requested for children (and unborn children in particular), childbirth, mothers (and expectant mothers in particular), motherhood, people falsely accused, good confessions and religious brothers. He was a man of great depth and insight, prayer and kindness. He was a mystic and a reader of hearts, ever seeking to be perfectly obedient to the will of God. Unfortunately his health was never good. He died from tuberculosis on October 16, 1755 at 29 years of age. Gerard was beatified on January 29, 1893 by Pope Leo XIII, and canonized on December 11, 1904 by Pope Saint Pius X. His feast day is October 16th.